"Moist, flavorful and absolutely one of the best meat loaf recipes yet! Using a large muffin pan allows the mini meat muffins to cook faster and makes portion sizing easier. I like to serve this with sweet potatoes or butternut squash. 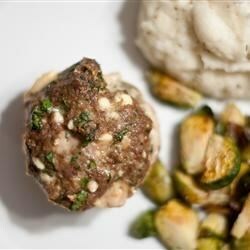 I think the mini meat loaves taste great the next day as they are easy to put away and re-heat. Try making a meat loaf sandwich out of them too." Preheat an oven to 375 degrees F (190 degrees C). Grease a large muffin pan with cooking spray. Combine ground beef, blue cheese, onion, bread crumbs, spinach, eggs, and Worcestershire sauce in a large bowl until well blended. Divide meat mixture evenly into the prepared muffin pan. Bake in the preheated oven until no longer pink in the center, about 30 minutes. An instant-read thermometer inserted into the center should read at least 160 degrees F (70 degrees C). A great quick steak and potatoes meal! made them lastnight for the picky eaters in my home....& WOW they both loved it!!! My 12yr old niece hates everything, and she asked for more! I used turkey instead of beef. Thank You! I loved this! I made it shaped as a regular meatloaf instead of the individual servings and added a ton of extra blue cheese since we love the flavor--and I can not wait to make it again! Very tasty. Gave it a 4/5 because I added more cheese, and coated the top with 1/4 c. brown sugar, 1/4 c. ketchup, and 2T worcestershire sauce.